The firm said the aim of the checks was not to measure the breaks taken by individual workers but to assess staffing needs to ensure all calls from customers were answered and it would now be reviewing the policy. 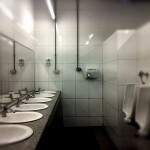 It is the latest example of lavatory rules in Norwegian companies. Last year the country’s workplace ombudsman said one firm was reported for making women workers wear a red bracelet when they were having their period to justify more frequent trips to the loo. Another company made staff sign a lavatory “visitors book” while a third issued employees with an electronic key card to gain access to the lavatories so they could monitor breaks. Did you see that, Alex? Employees at other companies are allowed to go to the restroom during their shifts. Why – in our crazy language – can your nose run and your feet smell? But fingers don’t fing and grocers don’t groce. If the teacher taught, why isn’t it also true that the preacher praught? In which your nose can simultaneously burn up and burn down and your car can slow up and slow down,in which you can fill in a form by filling out a form and in which your alarm clock goes off by going on. the man answers incorrectly (i.e. tells the truth). analyzed below, along with possible responses. about how I would spend the insurance money if you died.